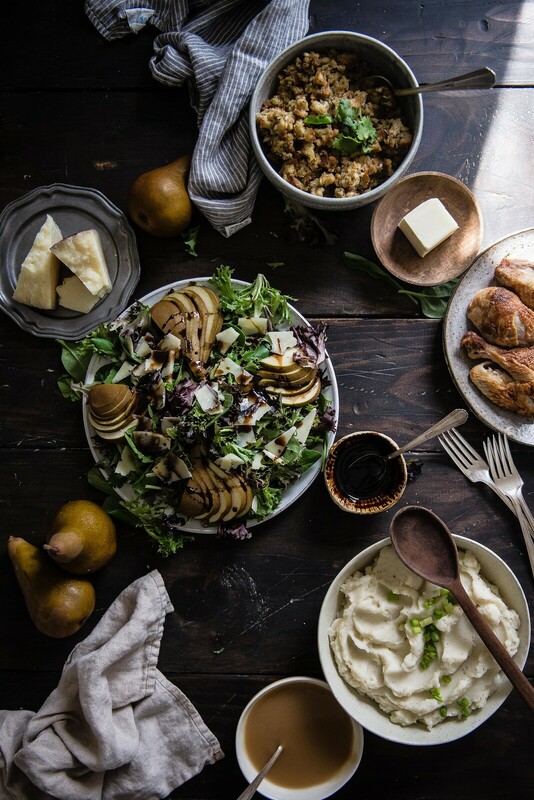 If our Christmas spirit is in full swing off the blog, evidently on the blog it’s still Thanksgiving, because this is a salad that I meant to share with you all weeks ago (hence why it’s nestled between stuffing and mashed potatoes — though in my opinion these two things could appear all year round). 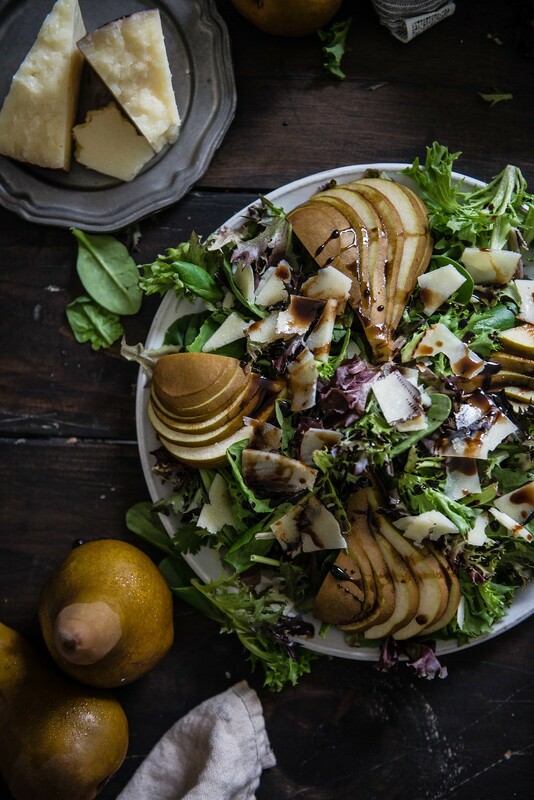 It was originally inspired years ago by a salad I loved at a little Soho Italian restaurant, an elaborate creation with slices of smoked mozzarella, fresh mozzarella, Parmesan, and pear arranged artfully over a bed of greens and drizzled with balsamic vinegar and olive oil. 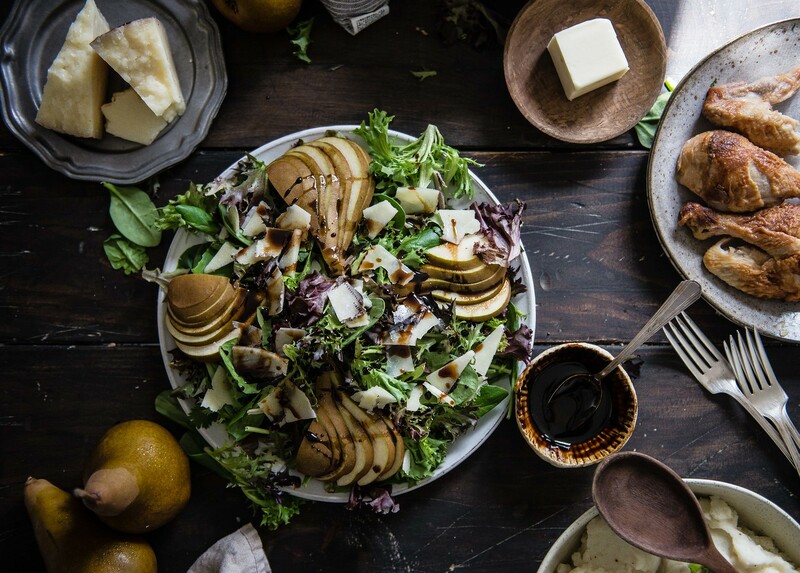 My favorite combination was always just the Parmesan and the pear, so this version pares it down to just the two; my only other tweak is swapping out the balsamic for a brown sugar balsamic glaze that I’ve loved since I made this, though you could by all means just use balsamic and it wouldn’t suffer in the least. It’s my very favorite salad for when you want to make something that looks elegant and tastes delicious but is actually stupidly easy (which is my favorite kind of easy in these early baby days). I think it would be just at home on any Christmas table as it was for Thanksgiving. To make the glaze, combine balsamic vinegar and brown sugar in a small saucepan over medium heat. When mixture simmers, turn the heat down to low and let bubble until reduced by half, about 5-8 minutes. Let cool and set aside. 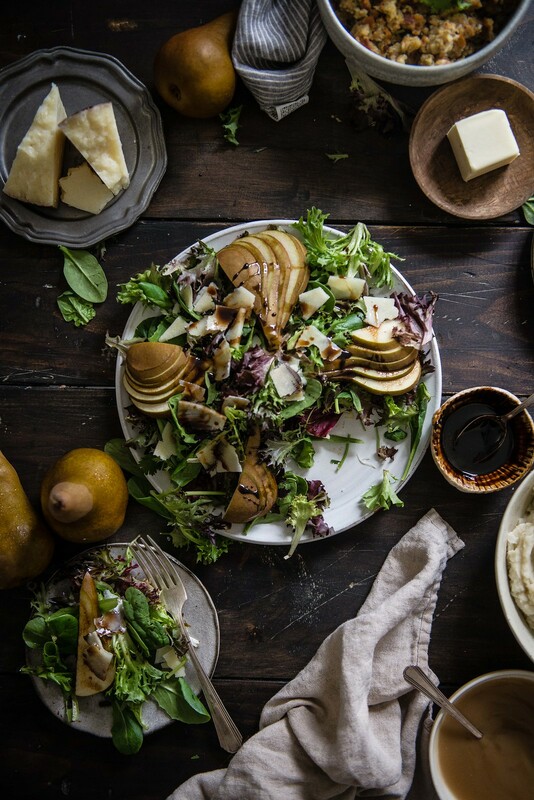 Combine greens, sliced pear, and shaved Parmesan. 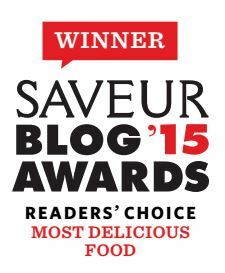 Drizzle with balsamic glaze and olive oil, and that's it. Enjoy! « thanksgiving leftover stuffing waffles! It’s SO SO beautiful. Love all the green!!!! 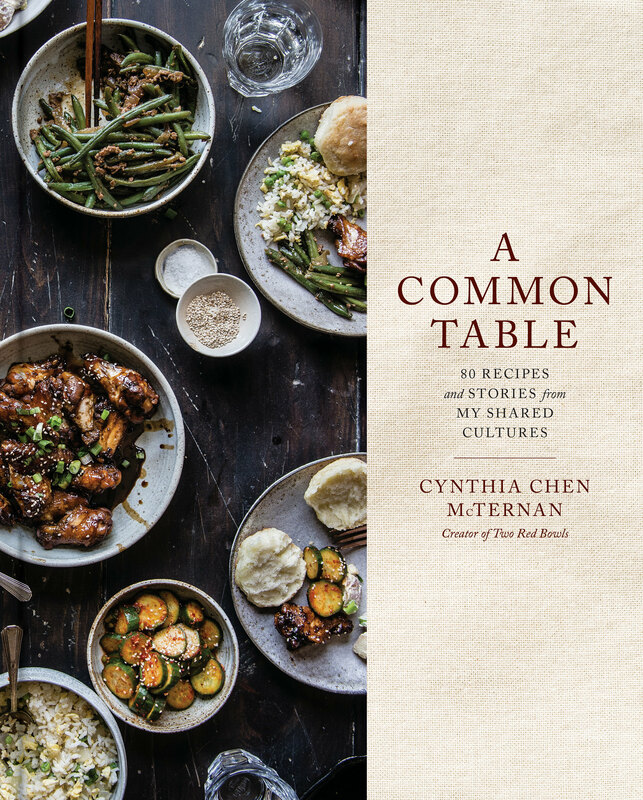 <3 <3 Hope you have a happy holiday season with your family, Cynthia!! “Very strategically placed in the corner of our living room to display the side with the least lop. But I think that’s what you call “character.” This is my tree every year!! I’m trying to be more of a “salad” person, this is not working out like I thought it would but this salad looks freaky amazing, so I need to try this and get on the salad train!! I’d eat this all year. It looks gorgeous.